A permanent exhibition hall for Korea has opened in the National Ethnographic Museum in Warsaw, Poland. According to the Embassy of the Republic of Korea in Poland, the opening ceremony for the Korean Exhibition Hall in the museum was held on February 22, attended by more than 150 people including key figures of the Polish cultural circle, diplomats and major journalists. The museum had presented several temporal exhibitions of Korean artworks so far, but it is the first time that a permanent exhibition hall for Korea has been established in the museum. The hall, which will be unveiled on February 23, displays about 40 Korean traditional and contemporary artworks and will be operated for 15 years. The Korean Exhibition Hall in the museum was designed with the concept of a traditional Korean house (hanok) divided into sarangbang (men's quarters) and anbang (women's quarters). Wooden furniture, ornaments such as ceramics, and folding screens, all of which were produced in the 19th and the early 20th centuries, are displayed to create harmony with the characteristics of each space. Most of the exhibits were purchased at private galleries in Frankfurt, the Turin Art Gallery, and auction markets in Hong Kong. In addition, the exhibition hall will also feature a rotation of modern Korean design works selected by the National Folk Museum of Korea in Seoul. The Polish press is showing a keen interest in the Korean Exhibition Hall. Many media outlets including the nation's leading dailies such as Rzeczpospolita, Gazeta Wyborcza, and Metro Warszawa Gazeta have covered the opening of the Korean Exhibition Hall. In particular, daily newspapers Rzeczpospolita and Gazeta Wyborcza introduced the space division of the hall as same as that of a Korean traditional house and its symbolic meanings, expressing interest in the life and culture of Koreans. Rzeczpospolita noted that Korean traditional houses were designed following the philosophy of 'borrowing beauty from nature' and that the houses featured furniture displaying a refined aesthetic sense in place and harmonized with the natural landscape. 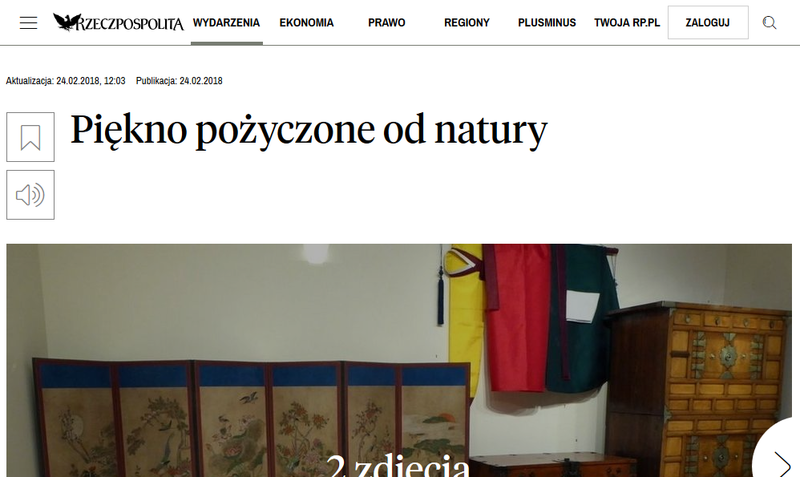 Gazeta Wyborcza interviewed Marcin Kuropatwa, the Coordinator of the Korean Exhibition Hall Project at the National Ethnographic Museum in Warsaw. With the project, the National Ethnographic Museum in Warsaw has become a museum with the most Korean artworks in Poland. Celebrating the opening of the Korean Exhibition Hall, the Korean Culture Week will be held for about a week starting from February 23, offering calligraphy classes, Korean food workshops, Korean music performances, and Korean movie screenings. The Korean Exhibition Hall is expected to bridge the cultural gap between Poland and Korea as a space where people can experience vivid Korean culture in Poland.